Have some suds and watch the beloved New York Mets at your very own Queens joint near Citi Field. 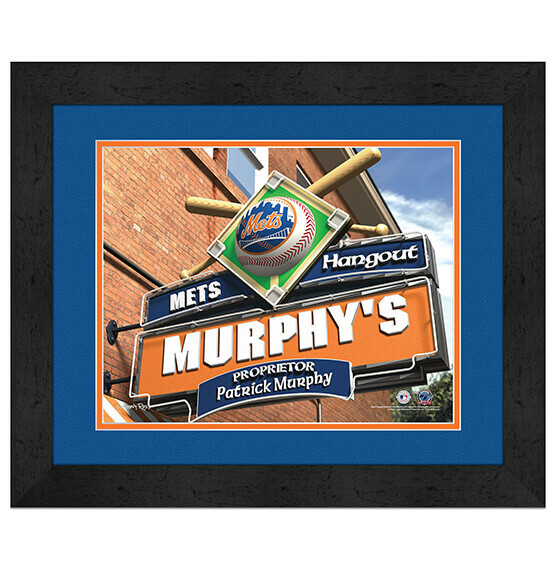 Our custom New York Mets Personalized MLB Pub Sign Framed Print lets you be the sole proprietor of your establishment — just tell us what name or nickname you want added to the marquee. This generous-sized print is the ideal addition to your fan cave. Or give this Mets sports decor as a gift that is sure to hit your gift-giving reputation out of the park. MDF vinyl-wrapped frame, quality glass and vibrant team colors and logos make this an excellent choice to buy for any occasion! It arrives ready to hang for your convenience.